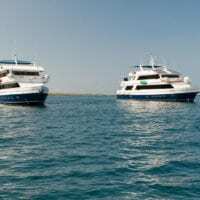 The 8 day Evolution Galapagos Cruise itinerary includes visits to Santa Cruz, Isabela, Fernandina, Bartolome, Santiago, Española and San Cristobal Islands. This charming 32-guest expedition yacht is ample enough to provide spacious staterooms, along with various social areas – including inside and outside dining – yet small enough for guests to be able to experience nature in an up-close and personal manner. This artful combination of factors results in a yacht which offers excellent service, accommodations and attention to detail, while causing minimal impact on the environment. All cabins come with private bathrooms, hot showers and air conditioning, and during landings your quarters will be cleaned twice daily. Your galley and dining staff will turn out quality meals using both local and international cuisine. Your vessel is stocked with “food for thought” as well—a library containing a wealth of information on the natural history of the Galápagos plus an entertainment centre complete with DVDs or videos. All our yachts, including sailing vessels, are equipped with engines to cover the distances of your itinerary expeditiously. This is your vacation and time to relax; all boats have plenty of areas to lounge in the sun or shade, and the bar is always open for refreshments. Sea kayaks are available for some additional fun and we carry snorkelling gear for all. Admire the incredible life under the sea, while snorkelling with rays, turltes, sea lions and colourful tropical fish. Get to see the famous Galapagos giants. At the Charles Darwin Research Centre, you will be able to see the largest living species of tortoise. Your Galapagos Cruise include: Accommodation in selected cabin, all meals and non alcoholic beverages, Island sightseeing, Naturalist guides and lecture services in English, Snorkelling gear, wetsuits, sea kayaks, shared transfers in the islands. On arrival in Baltra, you will be picked up at the airport by a naturalist guide, and taken on a ten-minute bus drive to the pier to board the M/V Evolution where you will have lunch. After lunch and a quick briefing, you will arrive to your first site: Whaler’s Bay, named for the tall ships that once took on provisions here. This excellent introduction to the islands offers an inviting cove with sandy beach rife with green olivine crystals. You’ll encounter a variety of seabirds and Marine Iguanas and your first chance to snorkel with Sea Lions both here and at nearby Eden Islet. Celebrate your first equatorial sunset with a welcome cocktail, followed by your first briefing and dinner. Tonight, you will set out for the western islands. This morning brings you to the northern tip of Isabela, the largest island in the archipelago. Your first visit is to Punta Vicente Roca, a dive class snorkelling site. Marine life is incredible in these nutrient-rich waters of the Humboldt Current, that bathe the western side of the archipelago. A panga ride takes you on a tour of seabirds perched atop cliffs and in crevices; all beneath the towering cutaway of Volcano Ecuador, created when it’s flank slid into the ocean. As you cross the Bolivar channel toward Fernandina, La Cumbre volcano, which erupts frequently (most recently in May 2005), looms large on the horizon. Next, you will visit Punta Espinosa, a narrow spit of land, where colonies of Godzilla-like Marine Iguanas, Sea Lions,Flightless Cormorants, and Galapagos Penguins live near one another. A hike across a cracked Pahoehoe lava field arrives at an aquarium-like Mangrove pond; home to Sea Turtles and Rays. Back ll make an easy, wet landing (a hop into a few inches of water). A stretch of maacross the Bolivar Channel, Urbina Bay lies directly west of Isabela’s Volcano Alcedo. Here you wirine reef was uplifted here in the 1950s leaving sculptures of high and dry coral as evidence. Set out in search of large, Yellow Land Iguanas and Giant Tortoises. Then, head up Isabela’s cost to Tagus Cove where a wooden stairway rises to a trail entrance and continues around Darwin Lake through a dry vegetation zone, ending in a promontory formed by spatter cones. The site provides spectacular views of Darwin and Wolf Volcanoes. Get ready for world class snorkelling above the green, algae-rich, underwater pastures of Tagus Cove where a herd of Sea Turtles, flocks of Penguins, Sea Lions, tropical fish, Flightless Cormorants and even Sea Horses can be seen. In the morning, visit Bartolome Island, famous for Pinnacle Rock, where you will see Galapagos Penguins and Sea Lions. Hike a trail to Bartolome’s summit where you will be rewarded with spectacular views of Pinnacle Rock, where the crystal blue waters of the bay cradle your yacht. Afternoon visit to Sullivan Bay, one of the most outstanding volcanic sites in the Galapagos. In the nearly 100 years since the Sullivan Bay Flow, only a few plants like Mollugo and Lava cacti have managed to take root in this harsh environment. Oyster-catchers can be seen fishing for crabs and molluscs in the tide pools of Sullivan Bay. After exploring the lava flow, there is swimming and snorkelling with playful Sea Lions off two small beaches. In the morning, visit Las Bachas, a sandy white-coral beach that is a major egg-laying site for sea turtles. The name Bachas refers to the remains of landing craft left here at the end of WWII. Ashore, marine iguanas mingle with flamingos and other wading birds in another of the many super saline lagoons found in the Galapagos. Afternoon visit to Dragon Hill, named for the large number of land iguanas that frequent the area, and an important nesting site for iguanas reintroduced by the Charles Darwin Research Centre. A short walk from the beach leads to a hypersaline (saltier than the ocean) lagoon that is frequented by pink flamingos, common stilts, pintail ducks and other species of birds. From here, they will pass through a forest of the endemic Scalesia tree. There are only 400 specimens of the Scalesia tree left in the world. Past the forest, hike up Dragon Hill for impressive views of the bay. Santa Cruz is the second largest island in the Galapagos and its capital, Puerto Ayora, is the economic centre of the Islands. In the morning, visit the Highlands, where the dry coastal vegetation transitions to lush wet fields and forests overgrown with moss and lichens. Your destination is the Tortoise Reserve, where you will have a chance to see these animals in the wild, walk through lava tubes and see the Gemelos; twin collapsed craters. In the afternoon, return to Puerto Ayora to visit Charles Darwin Research Station, to see the Giant Tortoise and Land Iguana Breeding and Rearing Program. The Fausto Llerena Centre receives about 7,800 visitors a month and currently houses about 900 youth and 70 adult tortoises. This project, which began in the 1970?s has been an incredible success in helping repopulate the Galapagos Giant Tortoise population. You’ll have time in town to enjoy a café and shop for souvenirs. Hood is the southernmost island of the archipelago, and is one of the most popular due to the breathtaking variation and number of fauna that inhabit the island. In the morning, visit Punta Suarez where you will be greeted by colourful red and turquoise marine iguanas, their darker cousins, masked boobies and blue footed boobies nesting along the cliff’s edge, as well as the famous waved albatross (from April to December). In the afternoon, visit Gardner Bay, a magnificent long white sandy beach, set against a turquoise bay where colonies of sea lions laze in the sun, sea turtles swim offshore and inquisitive mockingbirds boldly investigate new arrivals. Day 8 Sat San Cristobal Isl. Today visit the Galapagos National Park Visitor Centre on San Cristobal Island. The Centre presents a comprehensive exhibit of the islands’ natural history, human interaction, ecosystems, flora & fauna and your naturalist will use the exhibits to provide an illustrated overview of life on the Islands. A short trail arrives at Frigate Bird Hill, where both “magnificent-frigates” and “great-frigates” can be seen in the same colony. After this wonderful visit, you will be transferred to the airport for your ongoing flight.